On tuesday the 16th of April the Senedd timetable has the following item scheduled. ‘Obituary Tributes to Baroness Thatcher’. I know this because the Senedd petitions clerk told me after I had submitted a petition calling on the Senedd to not give this vile woman a minute of their time, let alone a minutes worth of silence. Back when we were initially celebrating Thatchers overdue death I mentioned the facebook page that was set up to oppose a minutes silence. The appropriately called "NO to a minutes silence for Thatcher in the Senedd". I suggested to them that they should start a petition, they messaged me asking if I would do the honours as I have submitted petitions before. No problem, so I loaded up the Senedd site and began to submit the petition. "NO! NO! NO! To a Minutes silence for Maggie. 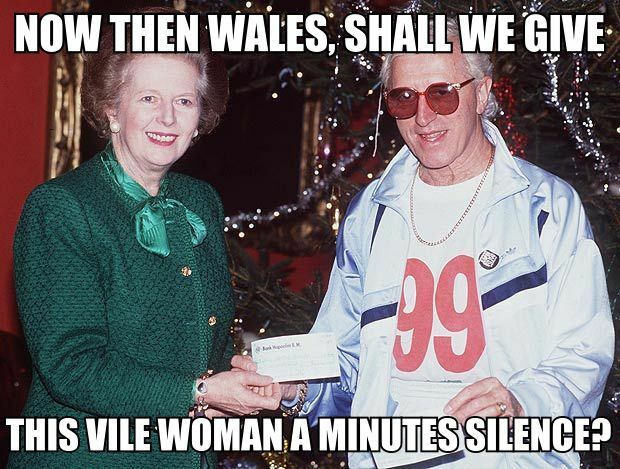 Thatcher is one of the most hated politicians the people of Wales have ever had the misfortune to have been ruled by. We, the undersigned, demand that OUR Senedd does not demean itself in fake sycophancy by showing this enemy of Wales the slightest gram of attention in the wake of her overdue death. During her callous reign Thatcher systematically destroyed communities all over Wales as well as targetting the weakest in our society. We should afford her the same courtesy that she afforded us, NONE." Today I had a reply. ‘Obituary Tributes to Baroness Thatcher’ are timetabled for the start of Plenary on Tuesday. We are not yet aware if this will include a minute’s silence. This, and all decisions on tributes in Plenary are for the Presiding Officer to make, and not something that the Petitions Committee can consider. So there we have it, just like we cannot raise a dead old witch we cannot raise a petition calling for our Senedd to ignore her. But, there is something we can do. For a start we can email the presiding officer and voice our disgust. We can email our AM, you can find yours here. Or better still, why not email EVERY single AM and tell them all that you are disgusted that they are to offer this vile woman any of OUR time when she had nothing but contempt for us. Just copy and paste ALL the addresses below into the recipients section of your email. Ot would be better if you write your own message but you can of course copy my text from above (in bold) or Penddus fantastic comment (below). Ask the AMs to boycott the "event", walk out or even sing "Ding dong! The witch is dead" throughout. It's bad enough Thatcher ripped the heart out of so many communities whilst she was alive, but tuesday her rotting corpse will be mocking Wales as our AMs belittle us like the subservient colony that we are. Edit - I have been accused of being "The Welsh version of the Westboro Baptist Church" which is amusing for a number of reasons. So despite the lunacy of this I have decided to create a WBC style banner. So because I haven't ever protested a funeral that makes me the equivalent of a group that protests funerals. I have a healthy disrespect for politicians, and there a number - from all parties - that I do not particularly like. However there has only ever been one politician that I have really detested - one who showed such utter contempt for peoples way of lives and such utter disregard for the people whose lives her policies destroyed. There is only one true enemy of Wales and that is the Labour party. Dont worry. 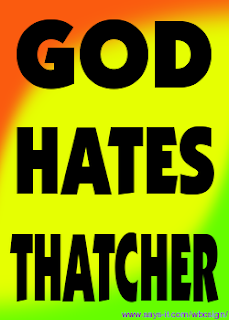 Normal service will resume once we've all stopped celebrating Thatchers death.